In a paradoxical turn of events, I applied to the Graduate Program of Spanish and Portuguese at Indiana University Bloomington, requesting to work with two professors. One of them was Gustavo Sainz. In my naïveté, Sainz was going to direct my research on the novel of the Mexican Revolution. Since both of us were mexicanos, I was quite sure I was going to work with my only professor paisano. I even had read La princesa del Palacio del Hierro before arriving. I said this was part of a paradoxical turn of events because I ended up working with other professors. For better or worse, Sainz, a leading member of the literary movement known as “la onda” (the wave), was not on my generation’s radar of the cool andtheory-driven­ professors around whom the students tended to gravitate. I ended working with anotherpaisano, a new professor who arrived a couple years after I entered the Ph.D. program. My first encounter with Sainz was unexpected yet filled with eccentricities that could have only happened in graduate school in the early 2000s. A friend of mine in another graduate program whose name I no longer remember was asked to read Gazapo for a class. She could not find Sainz’s book anywhere, including Amazon. (This during the years when Amazon was not as all-providing entity with drone delivery, but rather an establishing company delivering books – early days of the internet by today’s standards.) So, personal connections were essential in obtaining hard-to-find material that was not easily available on popular sites in those days. And having Gustavo Sainz on campus was a great “connection,” she concluded. I emailed him about the unavailability of his novels, expecting an answer of another online place where to find them. To my surprise, he invited me to stop by his office as he had available copies. I rushed to the fifth floor of Ballantine Hall to be presented with a minted Gazapo and a copy of his newly published novel, A Troche y Moche. He was perplexed that his literature was not available on the ever-more popular online place where you could find Carlos Fuentes, Juan Rulfo or Octavio Paz’s works. So was I. He dedicated the first novel to my friend and gave me the second for reading. I left his office inspired. In a single meeting in the fall of 2003, not only he had “solved” my friend’s problem (by providing her with a new free book), but she had a personal dedication, elevating the book from a class requirement to a personal reading imperative. How could you not read a book dedicated by Sainz? Even without a dedication, I read mine the following summer. 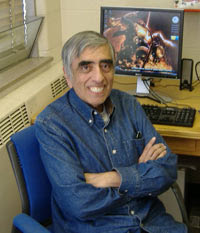 Although Sainz had worked with graduate students by the time I began my graduate studies, his graduate classes were in short supply at Indiana University Bloomington. I was not sure whether it was his or someone else’s decision. He was not as involved working with graduate students as the recently tenured or tenure-track professors. At least, that is how my cohort experienced it. Then, one fall the Latin American Cinema taught by Gustavo Sainz was posted for graduate students. It was promising class, in which I expected to be introduced to either general themes or a specific underlying topic, technicalities, theory, etc. of the seventh art of the Spanish-speaking countries south of the border. The simple fact that I was expecting all this confirms the class prospects raised by the theory-driven professors with whom I had taken classes before. But now I was taking a class with an art-driven professor, Gustavo Sainz. And nothing was as expected. This is how I felt taking his class: I experienced standing in wobbly sands from which I could never concretize a solid overreaching theme. My structured-trained mind could not comprehend the free-spirited observances where constantly changing forms without any underlying melody that could connect everything reigned. I still am not sure whether that class was a waste of time or the greatest artistic journey I failed to appreciate. I will never know. One thing I did realize in the class. Sainz was a cinephile subscribed to Netflix since the early days. A few of us did not even know that you could have DVD’s delivered by mail. (This is when Netflix did not have online streaming). In class, he recounted the movie watching gatherings of the 70’s in Mexico City. It was an event by today’s standards: invite the cream of the crop of the Mexican intelligentsia, bring the heavy theater projector to your house, “borrow” the multiple roll of films from your friends at the Cineteca Nacional, and have the movie projected in your house. A home movie watching using state-sponsored and state-owned film with the most brilliant people in Mexico City. I was hoping to hear him explain the reasons for leaving Mexico in his own words, as being a writer in “self-imposed” exile always seemed odd to me. Again, my expectations were not met. Perhaps, he just did come to Indiana University Bloomington to teach. Mario Bahena Uriostegui is an Assistant Professor of Spanish at Johnson C. Smith University. Having graduated with a Ph.D. in Mexican Literature from Indiana University Bloomington, Bahena Uriostegui currently lives in Rock Hill with his wife, Paloma Fernández Sánchez. Bahena Uriosteguis’s research focuses on the constructions of identities in literature of the Mexican Revolution.